Turbine Reliability - fact or fiction? Are turbine engines really more reliable than pistons, or is it a myth? The answer, writes Jim Tucker, depends on the helicopter. The development of airlines in New Zealand Brian Lockstone, MRAeS, considers the development of airlines in New Zealand. Neither a helicopter nor an aeroplane, the gyrocopter is in a category of its own. In New Zealand these peculiar but ingenious aircraft are making something of a renaissance, as John Nicolson writes. One of the most well-known helicopter flight schools in New Zealand, Heli-Flight NZ has been training pilots for over 20 years. Now with bases in Auckland and Masterton, the company is at the forefront of helicopter flight training in new Zealand. Pacific wings catches up with the company and talks with the main behind it. 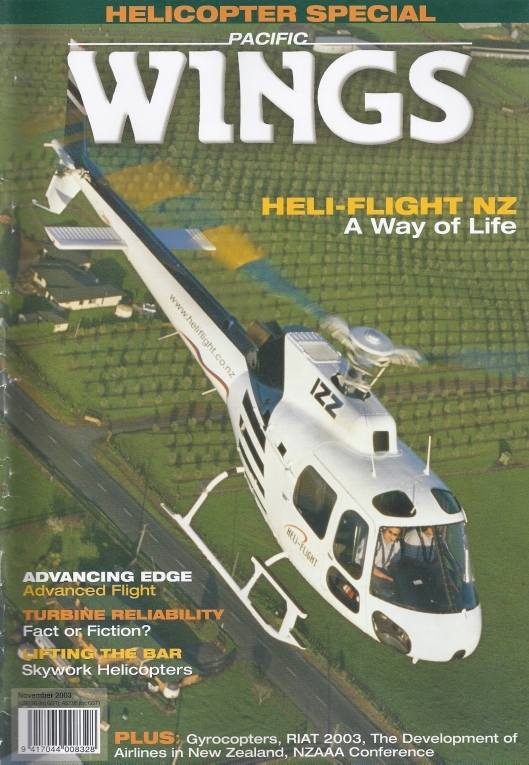 Established only in 1998, Auckland-based company Advanced Flight now operate and manage a range of executive helicopters for their respective owners. Peter Clark takes a brief look at this innovative company and its flagship helicopter, the EC-130. In this centennial year of aviation, Peter Cooper visits RAF Fairford for the world's largest military airshow to compare those pioneering aeroplanes with those of today. From the archives and memory of Mike Feeney. Additions, deletions and changes of ownership on the New Zealand civil register. By Dave Paull.